Just finished up a 40-day mantra challenge a week ago and began a new mantra. Five days into this new mantra, I am already feeling the effects and shifts that this mantra is calling into my life. This new mantra is four times longer than any other mantra that I have succeeded with chanting on a regular basis and so it took extra work to learn it, and it takes extra concentration to chant it, which is perfect for my mind which has been super busy with the transitions currently happening in my life. Mantra is like a prayer or the setting of an intention. It is a chant to be done aloud or silently, usually repeated 108 times. I have been practicing mantra for about five years and last year began to challenge myself to 40 consecutive days of practice. 40 days is an auspicious number for mantra practice. It is said around day 30 that your karma will make it challenging to continue by throwing obstacles in your path. That definitely happened on day 29-30 during my last 40 day challenge, with a studio merging with another and so 60% of my public classes are ending on Labor Day – catch me while you can! So I have been coping with a lot of stress and I have been in a survival mindset. With this big transition in life, I knew to begin a new mantra right away to align my energy with my intention. A more complicated and longer mantra would balance the stress, chanting mantra tones the vagus nerve, so it is calling and helps practitioners still their minds for meditation. We are powerful, if only we believe in ourselves. Mantra helps you gather your strength, focus, and the trust you need to be great. Are you ready to be your best? 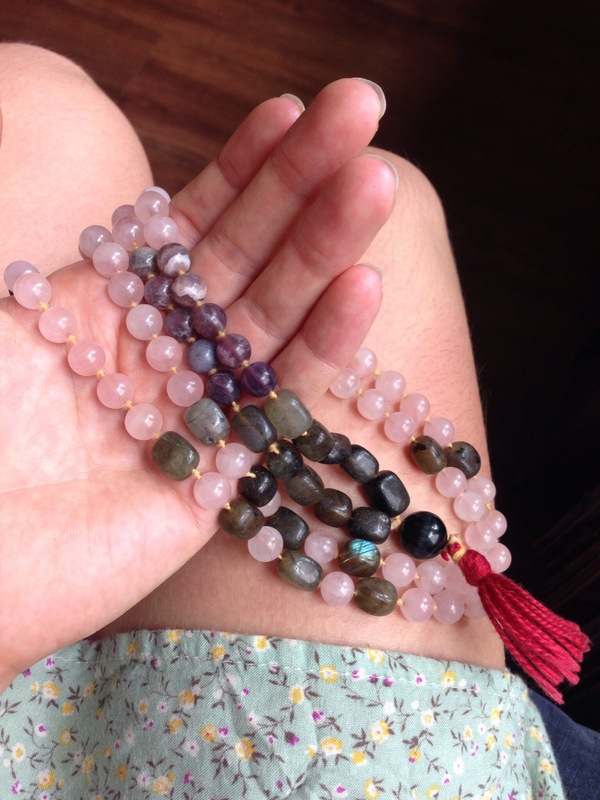 Check out my Offerings page to get your very own mala, like the one held in the photo above. This entry was posted in Uncategorized and tagged 108, ahimsa, asana, asteya, aum, awareness, body, community, compassion, conscious living, corporate yoga, dharana, dharma, dhyana, discipline, divine, Eco-friendly, environmental, hatha yoga, healthy, ishvara pranidana, karma, life, living, love, mala, mala beads, mantra, meditation, midwest, Milwaukee Private Yoga, Milwaukee yoga instructor, mind, mindful, mindfulness, natural, Nidra, niyama, niyamas, nonviolence, om, passion, practice, pranayama, private yoga, samadhi, satya, saucha, spirit, sustainable, svadhyaya, tapas, truth, unite, unity, Vinyasa, Yama, yamas, yoga. Bookmark the permalink.